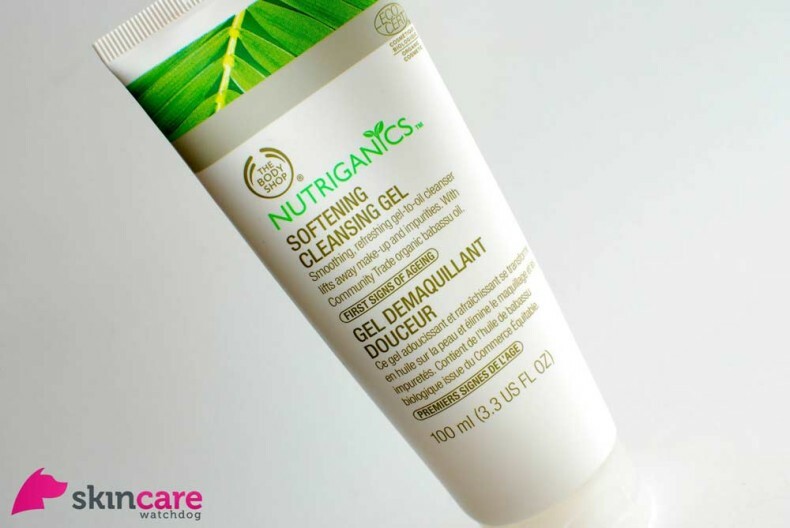 The Body Shop’s Nutriganics range is created to smooth out fine lines and wrinkles. It is specifically targeted at those customers who’s skin characteristics include the appearance of fine lines and wrinkles, dull looking skin and skin that is lacking in suppleness. The Body Shop suggestes the customer uses these products if your skin needs a revitalising lift. These products don’t only have to be used by those approaching the first signs of ageing, as prevention is better than a cure. The products should melt into the skin, and once washed away should leave your face feeling fresh and supple. When squeezed out the product is a gel, but as you start to work the product into the skin, it turns into an oily consistency making it extremely easy to work into the skin. Due to it becoming an oily consistency you do only require a small amount of product, as oil is more easily maneuverable around the facial area. Do not worry that the contents turns to oil, it does not leave your face greasy, in fact as it gets washed off, it turns into a cream so that it washes away easily, leaving you with nice, soft feeling skin. Due to this product changing to an oil consistency, makes it the perfect product to remove even waterproof mascara. There is no need to roughly rub this product into your skin as your skin absorbs as much as it needs without needing extra elbow grease to make it sink in. My tip whilst working it into the skin is to ball your hands up into fists and roll your hands around your face, not only does this work the product into the skin, but it also stimulates blood flow to your face. Working the product in with your fists makes it feel like you are having a massage, you also save money as there is no need to purchase a face massager. You can achieve so much more by using your knuckles as you know exactly what pressure to apply to your face. The use of Simmondsia Chinensis Seed Oil (more commonly known as Jojoba) is widely used as an emollient. You see this prooduct in a lot of bath cream products, because it is known for its moisturising element. This makes it the perfect product to use in your skin care regime as you can be assured that your face is being moisturised without being dried out. Having used these products for the past few weeks I can safely say that I would recommend the entire range. Focusing solely on the Cleansing Gel, I can see, as soon as I rinse the product off my face, that my skin is plumper, looks less dull and is completely moisturised. Touching my skin, it feels soft and flawless, I can feel no lines or areas for concern. It is the perfect product for creating a perfect base for your makeup application. At only £9, you get a large tube, and only needing a small amount, this product lasts for ages, and therefore is a great investment.